James, me, and our girls are going next summer to the Dominican Republic to serve together on a church mission trip, (along with two other families in our neighborhood.) We are so excited to introduce them to “the nations” and begin to expose their selfish hearts by visiting a country that looks much different than our little surburbia bubble (I say this to myself too, I have no doubt God will expose my selfish heart also.) Meanwhile, our missional community group has been brainstorming ideas how to teach our kids a love for the nations so they have a heart for missions. 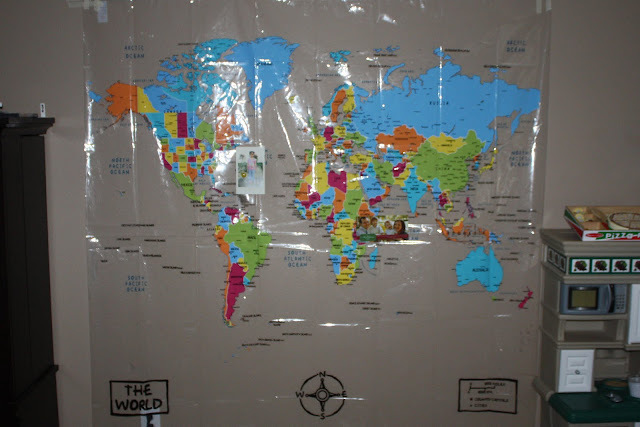 We talked with the pastor who puts together these mission trips to the DR and he suggested that we buy a world map shower curtain and put pictures up of our missionary friends in the country where they live, etc. This is where I bought ours! We put the shower curtain up on our wall in the playroom. 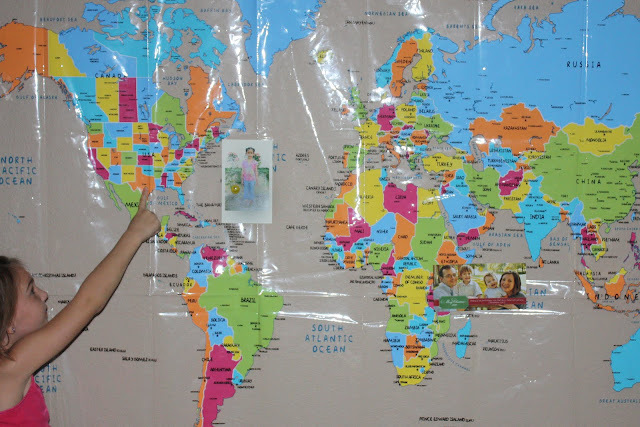 We added a picture of our girl that we sponser from Compassion who lives in the DR. We hope to meet her next summer! We also added our friends who serve in Ethopia. We will add more families as the weeks go on. Every morning, during our 5 minute Bible reading time before carpool for school, we read a verse(s) from Proverbs that corresponds to the date (we read verses in Proverbs 16 on September 16th). After that, we have added praying for the “top 25 countries that have the lowest Christian population” So on the 16th, we pray for Thailand because it has the 16th lowest population of Christians at 1.10%. We will then show them Thailand on the map. We want to start now and parent and pray for them to have a heart for the nations and missions! My husband and I just got back from a mission trip to the Philippines with our 5 year old twins. It was remarkable and life changing. Our reasoning was exactly what you described. So I encourage you as you go! It will be a wonderful time of bonding and acting out your faith. Exactly what you want your kids to imitate! We also pray as a family in the morning. We use the world index of persecuted christians around the globe. Here is link https://www.opendoorsusa.org/christian-persecution/world-watch-list/ . Open doors also has a prayer diary. You have great ideas on your blog! I will totally try some in my family too!